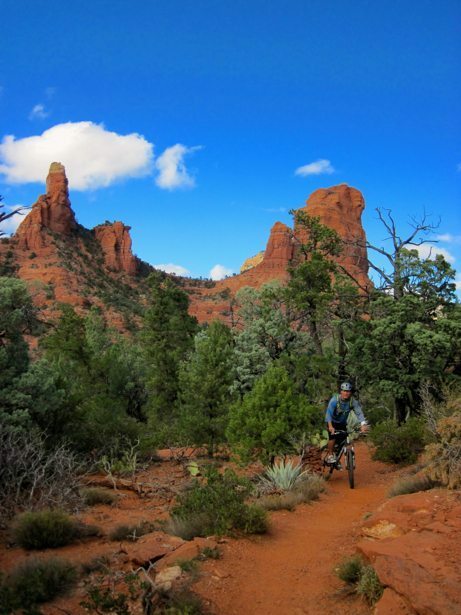 Sedona – land of Red Rocks, great mountain biking and energy vortexes… We unfortunately only had 24 hours to spend in town so we got up early and arrived in town by 9:30. 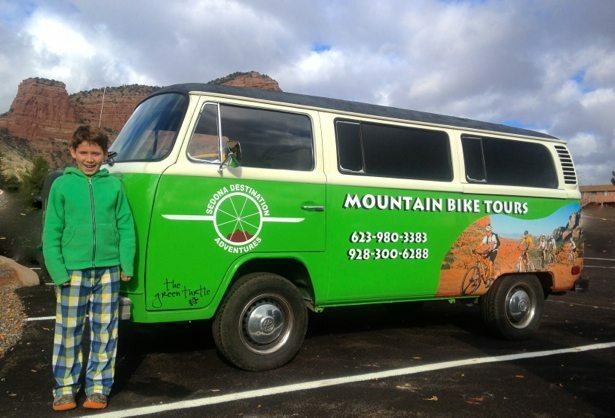 We started our visit with the boys at Sedona Bike & Bean and they were great – walked us through all the bike trail choices with lots of info and helped us settle on the Adobe Jack trail system right in Sedona. It was a set of intermediate interconnected trails that you could make into a short, medium or long ride. 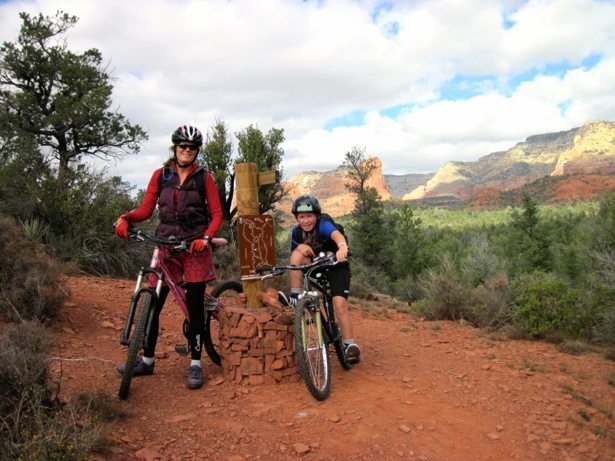 Sedona (and area) is a very bike friendly place – bike paths alongside every road and miles and miles of trails surrounding town. They said that the best riding is after they’ve had some moisture so things worked out for us as it rained 2 days ago. I guess it tamps down the dust from the red rock trails and you have less sliding out on fast corners. 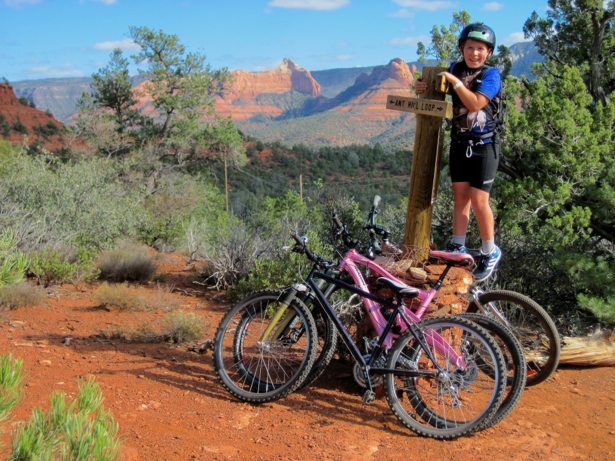 We checked into the campground – Rancho Sedona (very pricy and not worth the convenience trade off if you are staying for more than one day – go with the great state forest/BLM campgrounds) and headed off on our bikes from there. 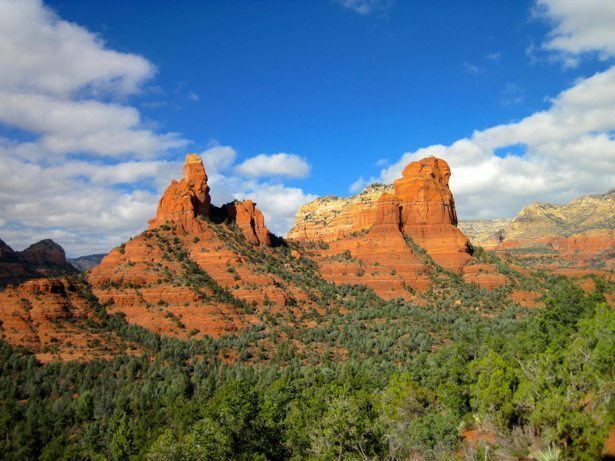 Sedona sits in a bowl between a bunch of small mountains and the scenery is breath taking, every where you look! The trails were perfect for us – flowy, some challenging up hills and some really fun challenging downhills. We rode about 10km of singletrack and another 6km exploring town. The afternoon warmed up fabulously (cool crisp mornings and evenings right now) and we had a great day! 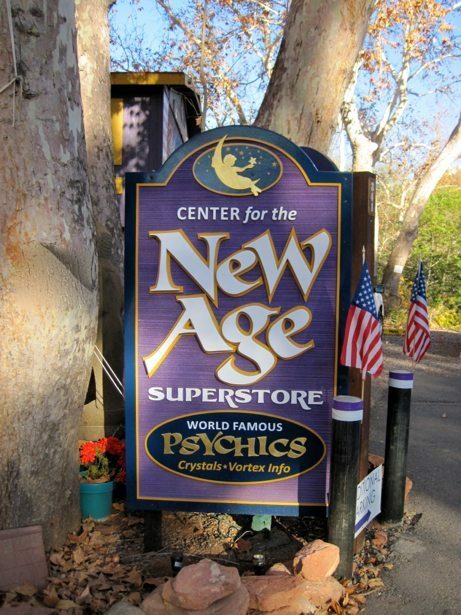 Sedona is also a mecca of new age spirituality due to the Energy Vortexes that are here. We did some reading before we went biking as we were intrigued. Can’t say we understand it 100% but you can definitely feel a sense of lightness (and not due to the elevation). 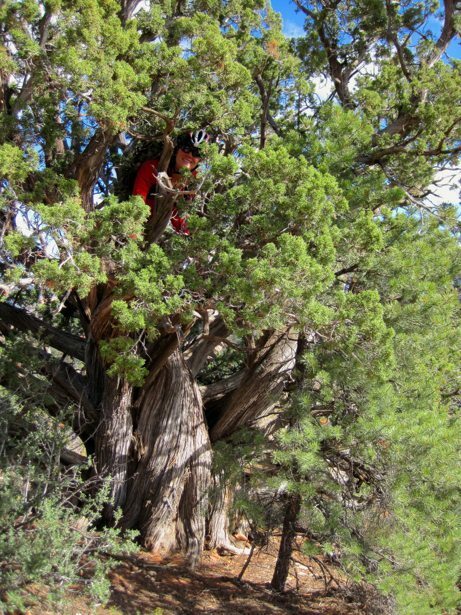 Even Tim, our resident sceptic, said he could feel the energy… They say that the best way to see where the Energy is located is to look at the Juniper trees and those with twisted trunks represent high energy areas. This one looked quite twisty to me so I thought I’d spend some time in it! Overall we had a great visit and would definitely come back. I give the mountain biking an A+ for family friendly – 4 bike shops in town, waterproof map that covers the entire area and really well marked trail intersections. The trails are easily accessible and have good parking lots.